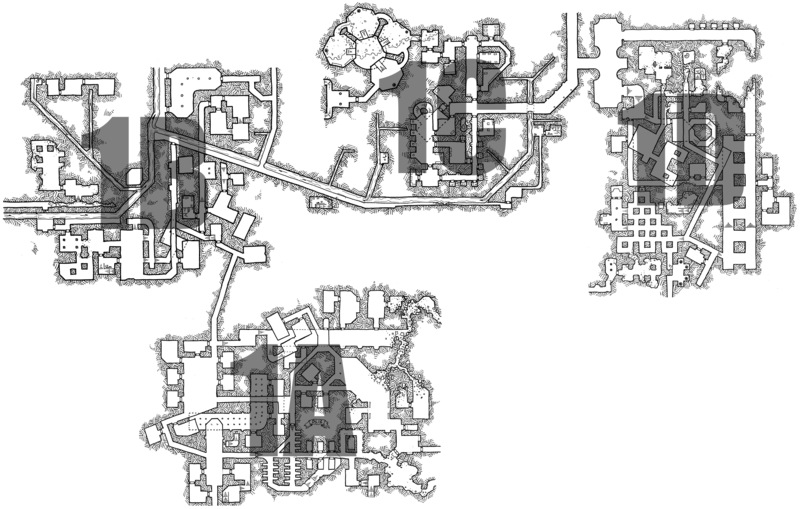 Continuing on the series of maps of a massive undercity project I am taking on. The goal is to produce a large set of maps that interconnect to produce something akin to, but very much different in style from, the original Jakallan Underworld map that M.A.R. Barker used in his Empire of the Petal Throne games. This is the fourth map in the set, this tag link will bring you to the full list of maps in the set. 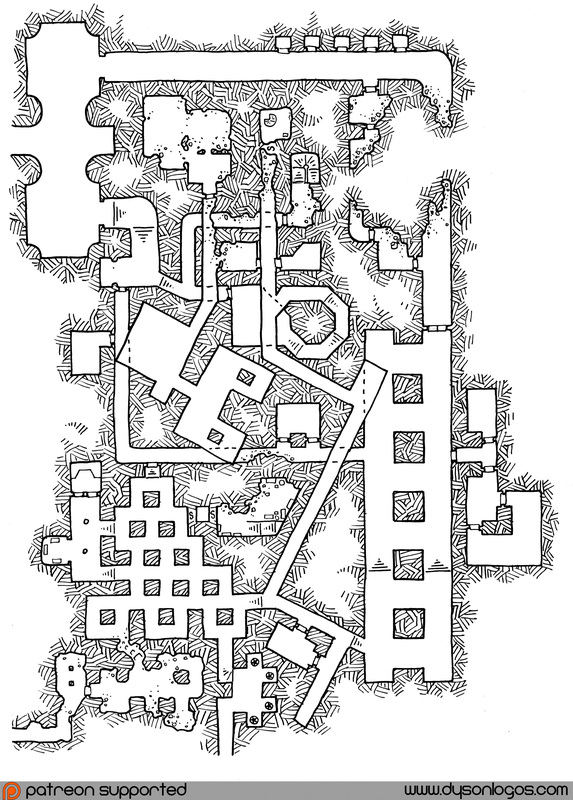 This portion of the undercity resembles in many ways the first section I did – containing a lot more temple & crypt areas and no sewer connections. It connects to section 1C via a major 20′ wide passage that I’m starting to think is a major underground thoroughfare for the priesthoods of a few major temples when they need to confer without sending processions marching through the city above. 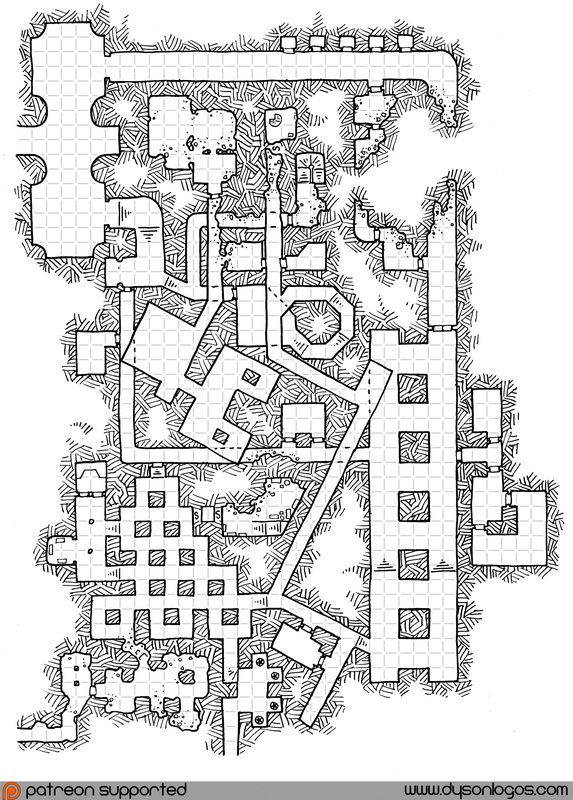 It connects to the upcoming 1E map on the lower left through some crumbling catacombs and has a further connection to the south (to what will probably be map 1F – unless I end up drawing the area above 1C first). There are two access points to the surface in this section, both of which are secret. They are both basements to local businesses or homes. The spiral staircase on the north side of the map leads up to a small stone home that has been rebuilt over the half-walls of the previous structures. The owners are unaware of the secret access route to the depths below. The other basement contains a large collection of boxes, barrels and other supplies belonging to the outfitter’s business above. The outfitter is quite aware of the basement doors, and both secret doors are locked and barred and an alarm is tied to each one to sound upstairs if either is opened. The outfitter occasionally rents out access from his basement to the undercity beyond. A major point of interest is the columned catacombs on the lower-left of the map. Evidently a combination of crypt and religious structure of an earlier age, the catacombs are not linked to any of the existing temples of the city, and in fact lie beneath a small common market used by the local farmers. Some upper sections of these catacombs are in very rough shape, cut into softer stone that has partially compacted and collapsed under the pressure of years. Throughout the catacomb, it is clear to anyone familiar with stonework that sections of the walls were cut out and then rebricked after the construction was complete. Pulling open these bricked-over niches exposes old crypts of the church that first built this structure. A final point of interest is the stairs that head downwards just to the southeast of the basement entrance (top middle of the map). This is the first connection to the deeper levels of the undercity added to the map so far. While seldom used, it is quite accessible to the temples that use the thoroughfare that goes through this map and map 1C. Great stuff on this newest project, really gorgeous. I’m assuming the megadungeon from some time ago won’t be getting a final compilation? I thought you had mentioned you would and check back from time to time to see.